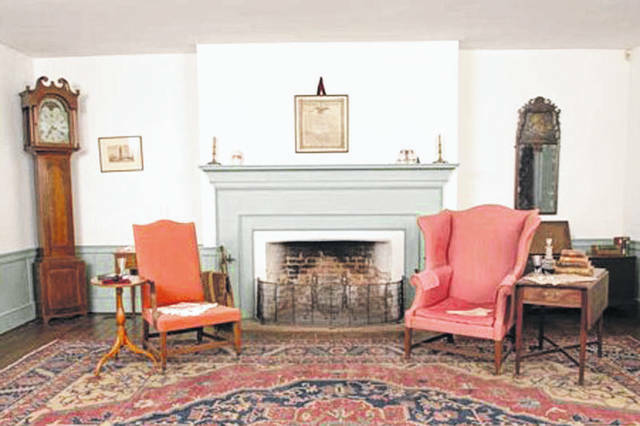 Provided photo Installed by local contractor John Carpenter nearly 50 years ago, the simple mantel pictured above will be among the structures restored to its original state as part of a project at the Johnston Farm & Indian Agency. In addition to reinstalling original fireplace mantels in the Johnston family home, the main stairway will be replicated, woodwork will be replaced, and period wallpaper and carpeting will be used. PIQUA — Johnston Farm & Indian Agency is in the process of going back in time with an ambitious project that will restore portions of the Federal-style farmhouse on the property to the way it looked when John Johnston and his family lived there. Built between 1812 and 1815, the home will get a facelift of sorts, one based on science and research of the period, along with the foresight of Piqua contractor John Carpenter nearly 50 years ago. “When I first came here, one of the first people I got to know was John Carpenter, who did some work on the farmhouse. There were about 2,500 slides taken during the original renovation project,” said Site Manager Andy Hite. Last summer, the pieces were sent to Columbus for cleaning, and now, Johnston Farm — in cooperation with the Ohio History Connection and the state of Ohio — is undertaking the $285,460 “Sharing the Vision” project to restore the home’s interior to its historically accurate state. “We’ve been talking about it for several years; we’ve now got a group of architects tho want to do things right,” Hite explained. “It’s been done at other places — the Adena Mansion in Chillicothe, Grant’s boyhood home — so the precedent has been set to re-restore a property. Hite said paint analyses have been done on the house, as well as studies and research about wallpaper and carpeting from the time period. “For instance, there’s evidence of wallpaper; you see some scraps of it in some of the rooms,” he said, referencing a particular spot in which original wallpaper was found behind a bookcase. “We do have some old photos, but basically, the house tells its own story,” Hite said. Hite said that many people don’t realize that the interiors of Federal-style homes often featured bright colors. A $78,000 capital grant from the Ohio History Connection is financing part of the project, which is currently in the fundraising stage. Corporate and private donors also have contributed, Hite said. Anyone interested in donating to the “Sharing the Vision” campaign can visit www.johnstonfarmohio.com and click on “Johnston Farm Restoration” to download a printable form. Hite speculated that the project will take more than a year to complete, but said visitors will be able to see the work in progress. “We’re going to keep the house open so people can watch it happening,” he said. “I think it will spur a lot of interest in what kind of house Johnston had. It will help us tell his story a little bit better, too. https://www.dailycall.com/wp-content/uploads/sites/30/2019/02/web1_Mantel.jpgProvided photo Installed by local contractor John Carpenter nearly 50 years ago, the simple mantel pictured above will be among the structures restored to its original state as part of a project at the Johnston Farm & Indian Agency. In addition to reinstalling original fireplace mantels in the Johnston family home, the main stairway will be replicated, woodwork will be replaced, and period wallpaper and carpeting will be used.